Intelligent Attentive Sensors: Powerful and inexpensive sensing platforms are being deployed everywhere, from urban canyons to mountain ridges. Advances in low-power CPUs have made it possible for sensor platforms to not just collect data, but process, analyze, discover important features, and actively control the sensing platform. Advanced sensor platforms are now more like autonomous deep space probes than simplistic data loggers. Scientists from a wide range of domains need to build and deploy sensor platforms with the most advanced, secure, and reliable computer science tools and techniques. So leveraging our expertise in extreme-scale operating systems and runtime software for supercomputers, we built Waggle, a Linux-based scalable, extensible, Open Source software and hardware platform designed to be extended, modified, and improved. Waggle is like an operating system for intelligent attentive sensors. Our platforms comes with a standard sensor board, but can easily be extended with new sensors. Fast Big Data: One of the “V”s of Big Data is “Velocity”. For many sensor applications, scientists want near-real-time access to collected and cleaned data. Waiting weeks or months to inspect data for misbehaving sensors, find actionable events, or stream the data to simulations reduces the value and impact of the data. For many applications, stale data is less valuable. Wireless networks and satellite links make it possible for many sensor platforms to preprocess, compress, and push data to a central repository where it can be immediately analyzed and streamed to computations. Scientists need their sensor data streamed quickly into complex workflows. So we designed Waggle nodes with a sophisticated internal data cache and interfaces for customized scripts to perform in-situ analysis, such as computer vision algorithms, before controlling actuators. Data is then queued for efficient transmission up to the cloud. Cloud Computing: Many scientific domains would like to quickly share their sensor data with other scientists, so team members can immediately perform data analysis computations or use the data as input to large-scale HPC simulations. 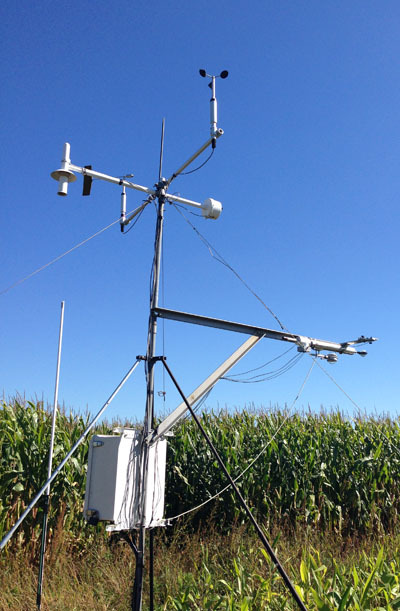 For example, one of the users of Waggle is working to link a parallel Weather Research and Forecasting Model (WRF) to live sensor data. So we designed Waggle to leverage the Nimbus cloud computing team and provide both a scalable cloud-based database for the sensor data, but also on-demand computation for analysis or simulation codes.